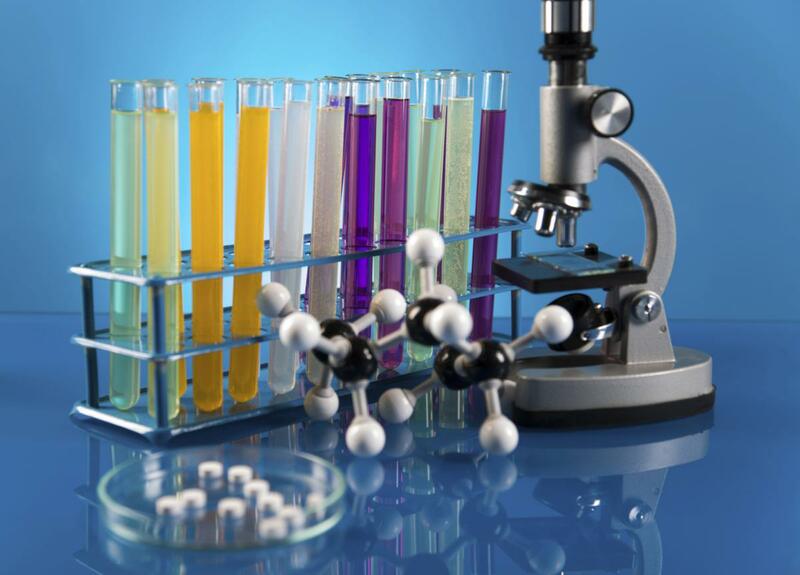 Microscopes allow researchers to peer into tiny cells and tissues by making the objects appear larger. However, visualizing extremely tiny cellular structures requires specialized microscopes that are very expensive, and even the most advanced microscopes are limited in how much they can magnify objects. 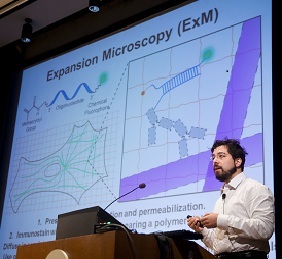 Using a paradigm-shifting technique called expansion microscopy (ExM), Pioneer and Transformative Research Awardee Dr. Edward Boyden is taking the novel approach of actually making the samples themselves larger. Using a material commonly found in baby diapers, Dr. Boyden and colleagues at the Massachusetts Institute of Technology (MIT) are able to expand tissues to about 4.5 times their normal size, enabling visualization of tiny cellular structures and proteins with ordinary microscopes. This material, called sodium acrylate, holds proteins in place while it swells in the presence of water, resulting in minimal distortion of the sample’s structure. Using ExM, researchers could image a 3-dimensional slice of brain tissue and could zoom in to see the tiny synapse where neurons communicate with each other. By eliminating the need for costly, specialized equipment, ExM has the potential to enable many more scientists to examine structures otherwise unobservable in the cell. Chen F, Tillberg PW, and Boyden ES. Expansion Microscopy. Science, Jan 2014, DOI: 10.1126/science.1260088. Researchers in the Common Fund’s Single Cell Analysis program have created a high-speed, large-scale 3D imaging system capable of visualizing the activity of individual neurons in a living animal. The technique created by Dr. Edward Boyden and colleagues at the Massachusetts Institute of Technology (MIT) and the University of Vienna can generate three-dimensional (3D) movies of entire brains at the millisecond timescale, the first time this has ever been accomplished. The new method optimizes a widely used technology known as light-field microscopy (LFM), which creates 3D images by measuring the angles of incoming rays of light. Boyden and colleagues sent the light emitted by the sample being imaged through an array of lenses, which refracted the light in different directions and generated about 400 different points of light. Using a computer algorithm, the points of light were recombined to generate the 3D structure of the sample. 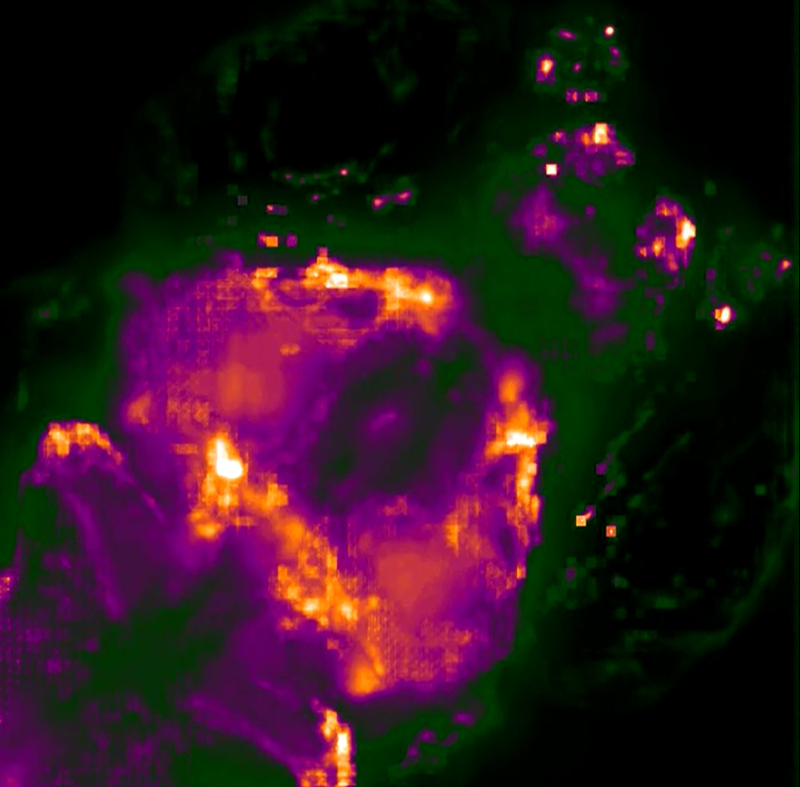 Using this new system they were able to simultaneously image the activity of every neuron in the worm Caenorhabditis elegans and the whole brain of a zebrafish larva expressing proteins that fluoresce when binding to calcium (a way to visualize neuron activation). The technique offers a more complete picture of nervous system activity than has previously been possible. Through monitoring and tracking neurons and neural pathways, scientists hope to discover how sensory input is processed and behavior generated. Prevedel R, Yoon Y-G, Hoffmann M, Pak N, Wetzstein G, Kato S, Schrödel T, Raskar R, Zimmer M, Boyden ES, and Vaziri A. Simultaneous Whole-Animal 3D Imaging of Neuronal Activity Using Light-Field Microscopy. 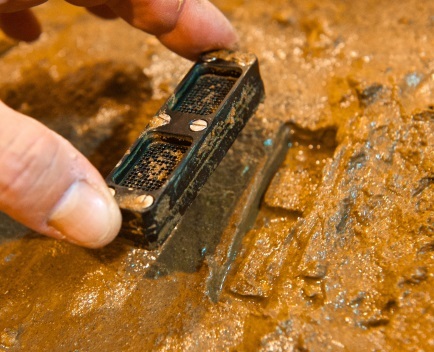 Nature Methods, July 2014. PMID: 24836920. Extracellular RNA Communication Researcher Discovers "Treasure in Saliva"
Research supported by the Common Fund’s Extracellular RNA Communication program is laying the foundation for using extracellular RNAs (exRNAs) in saliva to diagnose a variety of diseases, such as cancer, diabetes, autoimmune disorders, and potentially many more. Dr. David Wong and colleagues have conducted the most comprehensive analysis of human exRNAs in saliva to date, and have made several interesting discoveries. One surprising finding is the discovery of approximately 400 circular RNAs in saliva. Circular RNAs were only recently discovered to exist within cells and tissues, and this study marks the first discovery of circular RNAs in any body fluid. The researchers also discovered that saliva contains a significant number of piwi-interacting RNAs (piRNAs), whose functions are largely unknown. In contrast, blood and other body fluids contain very few piRNAs, suggesting that the salivary piRNAs did not originate from RNAs in the blood, and may have originated instead from skin or stem cells within the oral cavity. MicroRNAs (miRNAs), which play important roles in gene regulation, were also found in saliva, and show similar variability between individuals in the saliva samples compared to miRNAs from blood samples or within cells. This result suggests salivary miRNAs may have potential as stable biomarkers that can distinguish between individuals, with the advantage of being easily accessible compared to other body fluids. Together, this research is the first step for future studies on the biological functions of exRNAs in saliva, and opens the door to using salivary exRNAs as non-invasive biomarkers for a number of diseases. Bahn JH, Zhang Q, Li F, Chan T-M, Lin X, Kim Y, Wong D, and Xiao X. The Landscape of MicroRNA, Piwi-Interacting RNA, and Circular RNA in Human Saliva. Clinical Chemistry, November 2014. A compound originally identified with the support of the Molecular Libraries program has led to a drug candidate now entering a Phase 1 clinical trial in patients with multiple myeloma that has proved resistant to two or more established treatment options. The experimental compound, CB-5083, inhibits a protein called p97 that is critical to many cellular functions, including cell division. CB-5083 is derived from a compound called ML240 that was initially identified by Dr. Tsui-Fen Chou, working in the laboratory of Dr. Raymond Deshaies at Caltech. To identify ML240, Drs. Chou and Deshaies collaborated with members of the Molecular Libraries Probe Production Centers Network, including the Scripps Molecular Screening Center and the Specialized Chemistry Center at the University of Kansas. 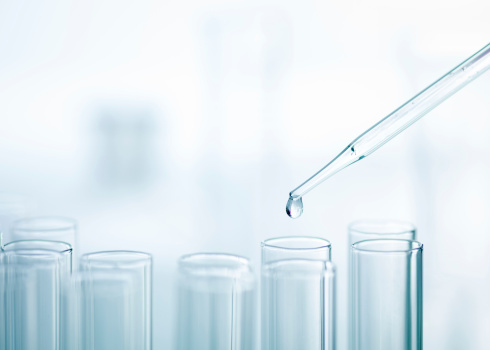 Ongoing research with CB-5083 has shown promise in treating other types of cancer in mice, and Phase 1 clinical trials for CB-5083 in the treatment of solid tumors are expected to start later this year. Read the press release from Cleave Biosciences. Read more about the Molecular Libraries contribution to CB-5083 in the Common Fund 10 Year Commemoration Book, under the “Molecular Libraries and Imaging” section. Cancer, generally speaking, occurs due to unregulated cell reproduction. As cells grow and multiply unchecked they need to produce more proteins, ultimately leading to the formation of tumors. While it has long been known that cancer cells increase their production of proteins, the interface between production of proteins and gene expression in cells has remained unclear. In a 2013 study published in the journal Science, a research team used complex analyses to better understand these interactions. Through the use of Common Fund supported LINCS data, the researchers were able to show that HSF1, a critical cell regulator, was highly controlled by the production of proteins. The LINCS data used for these analyses are a large catalog of how human cells react at the genetic level to changes induced by a vast array of chemicals or interfering genetic molecules. The analyses of the data showed that the response of cells to an agent that blocks proteins from being made is similar to their response when a protein that controls genes is blocked, suggesting that this protein (HSF1) regulates the production of proteins in the cells. This is a key finding in better understanding why cancer cells continue to have energy, while ordinary cells would otherwise be worn out. HSF1 has long been known to be a critical regulator in cancer, playing a large role in maintaining uncontrolled growth. Therefore understanding how HSF1 is controlled is an important finding in the search for improved cancer treatments. In the study, the research team was able to use this information to reverse HSF1 activation and suppress tumor growth in a mouse model. In the model, human leukemia cells were grafted into the mice, showing that the effects have a potentially promising role in humans. These results are very encouraging for future studies that could impact a number of tumor-forming cancers affecting humans. Santagata S, Mendillo ML, Tang YC, Subramanian A, Perley CC, Roche SP, Wong B, Narayan R, Kwon H, Koeva M, Amon A, Golub TR, Porco JA Jr, Whitesell L, Lindquist S. Tight coordination of protein translation and HSF1 activation supports the anabolic malignant state. Science, July 19, 2013; 341. PMID: 23869022. The maintenance of cognitive ability during the aging process has become a significant medical challenge of our time. Alzheimer’s disease (AD), currently having no treatment, is one of the leading causes of death in the United States. A host of other neurodegenerative diseases cause a decline in mental ability that is capable of interfering with daily life. The reasons for the onset of these diseases are still being examined. Earlier studies suggest that neuronal loss was a normal consequence of brain aging; however, neuronal cells are preserved in the aging brain and decline only in the presence of neurodegenerative disease. Much of the research into the causes of diseases resulting in dementia has focused on the abnormal proteins that appear in the brains of people with neurodegenerative diseases; however some people with these abnormal protein clumps show little or no signs of cognitive decline. Why is it that some individuals, even those presenting dementia pathology, age with their cognitive function intact while others develop dementia? A new study, led by Pioneer awardee, Dr. Bruce Yankner of Harvard Medical School, begins to answer this question. Dr. Yankner and colleagues have discovered a mechanism involving repressor element 1-silencing transcription factor (REST), a repressor of neuronal genes during embryonic development that is down regulated after this stage. The researchers show that REST returns later in life to protect aging neurons from various stresses and regulates a network of genes that mediate cell death, stress resistance and dementia pathology. In an example involving AD, in its early stages, REST disappears from the nucleus, causing the gene network to lose regulation. Further experiments in the study indicate that REST protects neurons from age-related toxic insults and that the elevated REST levels in aging humans are associated with the preservation of cognitive function as well as increased longevity. Additionally, the presence of REST increases the expression of other transcription factors and enzymes that act to resist oxidative stress. REST is also shown to protect against a model of a different dementia disease, Parkinson’s disease, indicating that it might be involved in a stress response that is protective of neurons in a range of dementia diseases. So, even when harboring the abnormal protein clumps associated with dementia diseases, when neuronal REST levels are high, these individuals do not proceed to dementia, suggesting that dementia protein presence may not be enough and that failure of the brain’s stress response system may also be necessary to present cognitive inability. This finding introduces new possibilities for therapeutic intervention. To read more about this research, please see the publication in Nature. Researchers in the Common Fund’s Extracellular RNA Communication program have discovered a potential treatment for multiple sclerosis (MS), a devastating neurological disorder characterized by muscle weakness, vision problems, difficulty with balance and coordination, and sometimes paralysis. Dr. Richard Kraig and colleagues from the University of Chicago are investigating the therapeutic potential of exosomes, small particles containing biologically active molecules such as RNA and proteins, which are released from cells to travel throughout the body and affect other cells at a distance. Dr. Kraig’s research shows immune cells can be stimulated to produce exosomes that promote formation of myelin to restore the protective insulation around nerve fibers that is damaged in MS. These exosomes contain small pieces of genetic material called microRNAs. Some microRNAs in the exosomes influence immature brain cells to develop into myelin-making cells called oligodendrocytes. 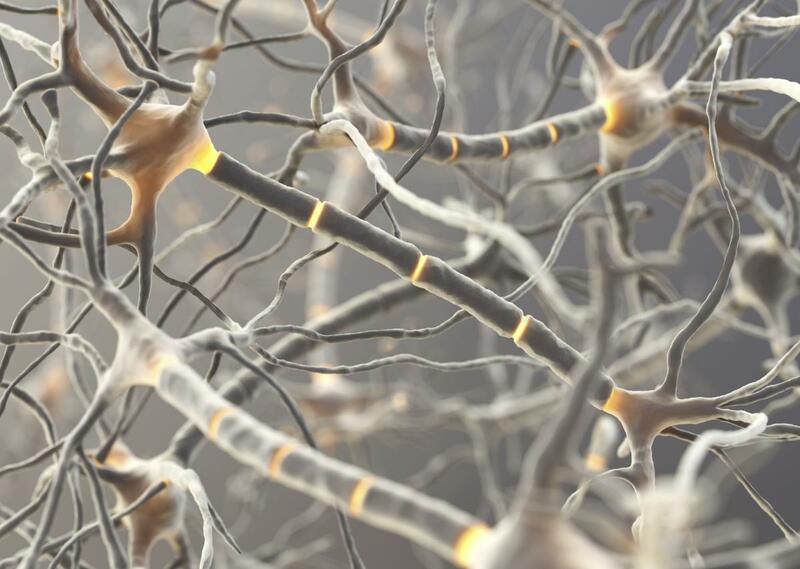 Other microRNAs protect against inflammation, thought to contribute to myelin damage in MS. Treatment with exosomes containing these microRNAs increases myelin in both healthy rodent brains and in rat models of demyelination that mimic MS. Importantly, a nasal spray containing exosomes with microRNAs was found to increase myelin in rat brains, suggesting that this type of treatment may be easily administered. In related research, Dr. Kraig and colleagues found that microRNAs in exosomes from young animals and animals living in environmentally enriched conditions also promote myelination, suggesting multiple factors may influence production of microRNA-containing exosomes with therapeutic potential. Further studies will be needed to determine whether exosomal microRNAs can be used to treat patients with MS, but these early studies are a promising first step in developing microRNA-based therapeutics for MS and possibly many other neurological diseases and conditions. Pusic AD, Pusic KM, Clayton BLL, and Kraig RP. IFNγ-stimulated dendritic cell exosomes as a potential therapeutic for remyelination. Journal of Immunology, Jan. 15, 2014; 266(1-2): 12-23. PMID: 24275061. Pusic AD and Kraig RP. Youth and environmental enrichment generate serum exosomes containing miR-219 that promote CNS myelination. Glia, Feb. 2014; 62(2): 284-299. PMID: 24339157. Remyelination: Are Exosomes Containing microRNA the Answer?